This month is all about unique pencils! 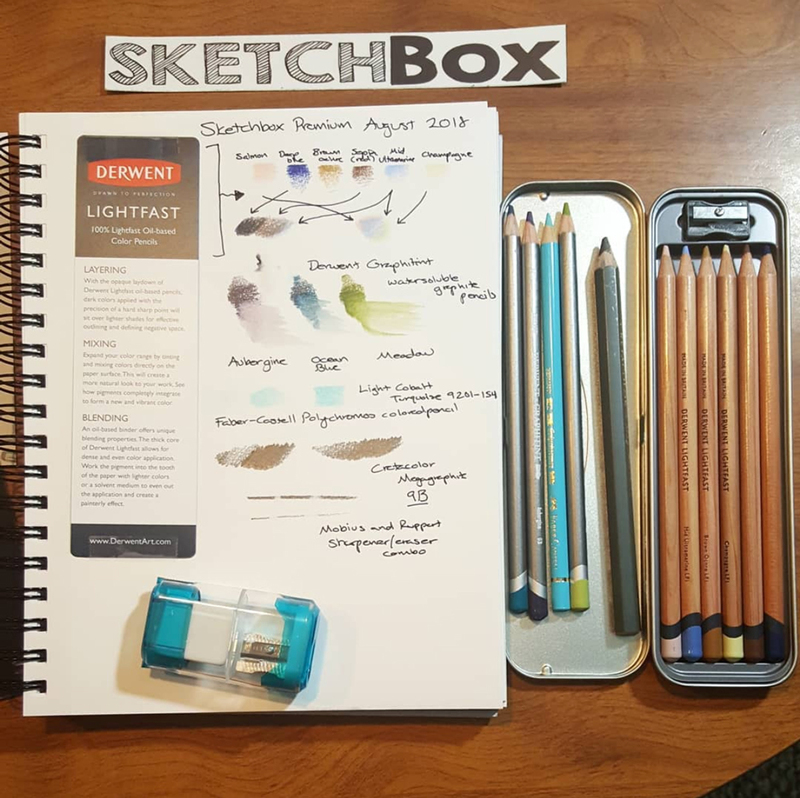 First up we included a custom set of Derwent's brand new Lightfast Pencils. Simply put, these are the highest quality lightfast colored pencils available. They’re a brand new formulation from Derwent that is 100% lightfast. How new are they? We partnered with Derwent to give you the absolute first look before they hit stores. In fact, this tin will only ever be available in this box. We assembled these sets ourselves because the new packaging wasn’t even made yet. The colored core combats the effects of UVA-radiation and maintains the longevity of colors on permanent display. Derwent Lightfast pencils are oil-based, smooth and creamy with a beautiful laydown of rich color. The thick core gives a dense color application which brings vibrancy to any drawing. We chose Champagne, Salmon, Sepia (red), Mid Ultramarine, Deep Blue, and Brown Ochre to give you a versatile palette for portraiture, landscapes, and more. Next up we included 3 Derwent Graphitint pencils. These are graphite pencils with added colored tint that are water soluble. We chose three colors to complement the set of LightFast pencils. We also included a Faber-Castell Polychromos pencil to allow you to compare its quality against that of the Lightfast pencils. We also included a Cretacolor MegaGraphite 9B pencil to allow you to sketch out a piece before adding color. These pencils are great for shading as well. Finally we included a Mobius and ruppert sharpener and eraser combo. They make some of the best sharpeners available. Made in Germany, their high quality manufacturing standards aren’t matched by many other brands. This is a single-hole container sharpener with eraser and has a convenient flat and compact shape. The corrosion resistant, long-lasting and replaceable hard metal blade works great for graphite and colored pencils. The sliding shutter keeps pencil shavings contained. This picture was taken by our talented subscriber @kaehutchens on instagram!